Well, even though the Obama camp hasn’t yet sent out their super-cool text message VP announcement, it’s been leaked… BO’s choice is Delaware Senator Joseph Biden. In other news, the chronic insomnia I’ve struggled with for years may have just been cured. 1. 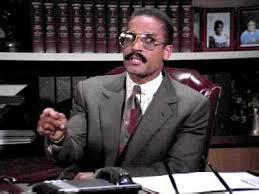 That guy who played attorney Jackie Chiles on Seinfeld (actor Phil Morris). Let’s come to terms with the elephant in the room, people: Obama is Black, which is historically interesting. He’s also got the charisma of a paper plate, which sort of puts a cloud over this historic opportunity. Let’s get another Black guy who’s hilarious. 2. Barak’s long-lost Kenyan brother, George. This is an interesting story. Apparently Barak’s dad had another son, George, who has grown up in Kenya and currently survives on about a dollar a month and lives in a small hut. By all indications, although he’s excited about Barak’s notoriety, George seems content with living a reclusive live. Isn’t that essentially what the Vice-President does??? So if Barak makes George the VP, he can help his brother (which gets all those “why doesn’t he help his brother” people off his back), and his brother can set up another little hut down the street from the White House. Everyone wins. Oh, I did not know that about the brother. Yikes. 1. Phil Morris IS hysterical plus he’s Greg Morris’ son, so he’d probably bring cool “Mission Impossible” stories to the party. 2. I think this George should replace George Foreman on his show. They already have the “George” marketing, and surely the new George could only be an improvement! !